One of the highlights of my time at work is when a group of special visitors comes into the store with a care giver. They typically range from nonverbal to conversational. I love to help them, and begin a conversation, when possible. Today, I welcomed a small group as they came in. To my, “Hello, welcome in.” I was, in turn, greeted, unremarkably, except for one young man wearing headphones who, with a hitchhiker’s thumb, gestured to the care giver behind him and said, “She’s mine.” We smiled. Later on, during my break, I came upon one of the visitors at the cafe. Today’s sketch is about waiting, but the waiter is the artist. This is a first-person waiting situation. The subject is not waiting at all, but rather actively engaged in reading. She was reading aloud to herself. I liked watching her and I liked sketching her. 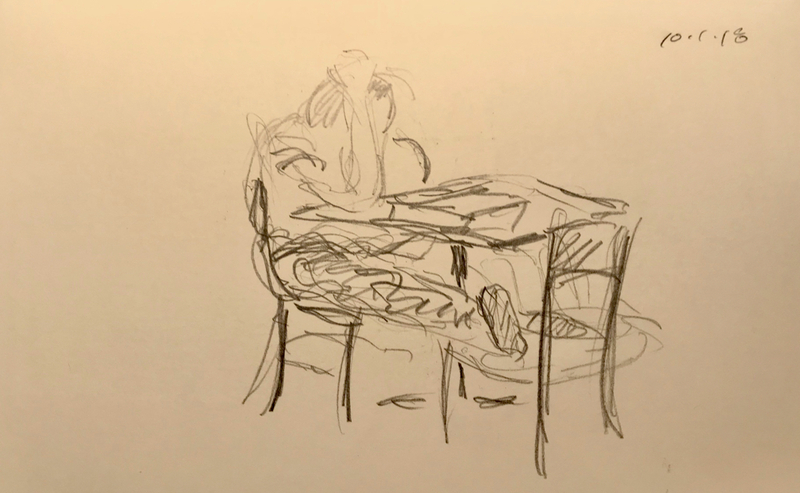 This entry was posted in Personal Stories and tagged art, artistic expression, artistic process, down syndrome, drawing, pencil sketch, reading, reading aloud, sketch, special needs. Bookmark the permalink.